Lessons for all – absolute beginner or aspiring expert! We have courses of lessons starting from 04 March and again from 22 April. In March we have two courses for complete beginners. From April we offer two courses for more experienced players – Sharpening Bridge (our most advanced yet) and Key Conventions 2. There are lessons for all levels in between as well! Dates also to learn in a day (‘Bridge in a Day‘). Courses are complemented by our practice sessions – Supervised Play. 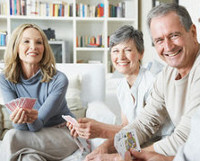 This is the ideal format to consolidate and improve – a learning environment with emphasis on relaxed and enjoyable Bridge. 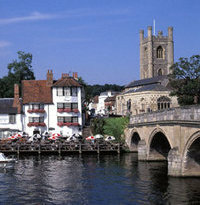 Note that these sessions continue without interruption until at least the end of May – the only exception is Easter Monday when there is no Bridge. We continue at Henley Cricket Club on Tuesdays and Thursdays until 11 April. From then on all sessions will be held at the Red Lion. Due to cancellations, there are again a few spaces remaining at the charity Bridge drive on 01 March. Please contact us with any questions – we’re always pleased to hear from you! 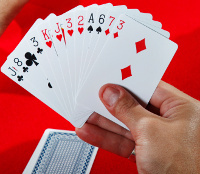 We’re back from 14 January with a new format for Duplicate Bridge – Deal & Discuss. 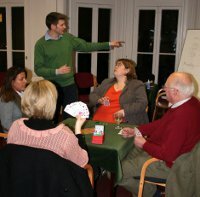 This is Duplicate Bridge with a difference! 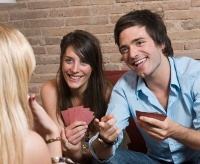 First play each deal in our friendly and enjoyable atmosphere. Then take a look, discuss what might have happened, and learn from any mistakes. As ever, we’re running lessons for all levels from absolute beginner to more experienced club players. Take a look at our courses for 2013. 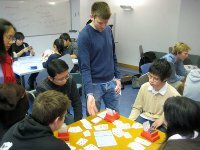 There’s always our option to learn in a day (‘Bridge in a Day’) rather than during a 6-week course. Find our dates here. Courses are complemented by our practice sessions – Supervised Play. This is the ideal format to consolidate and improve – a learning environment with emphasis on relaxed and enjoyable Bridge. Please contact us with any questions or for further information – we’re always pleased to hear from you! I wish you all a restful and thoughtful festive period.